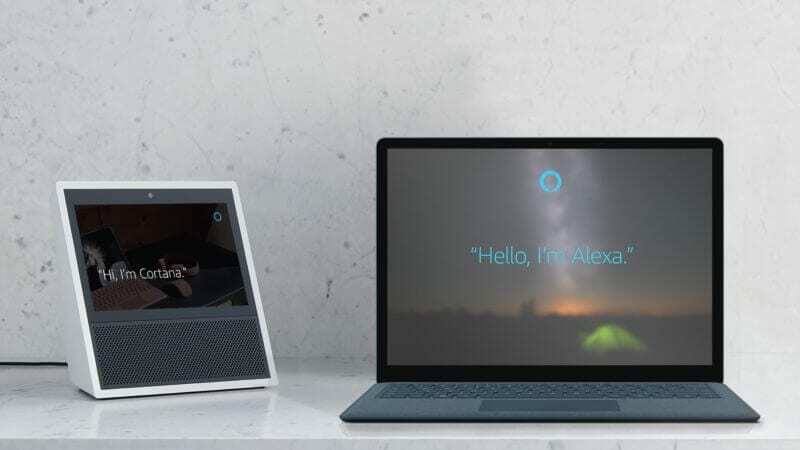 Roughly a year ago, Amazon and Microsoft announced that they each would be integrating their respective digital assistants into the other’s platform and devices. Alexa becomes available on Windows computers (and Cortana-powered smart speakers), and Cortana will be available through Alexa devices. I’ve seen some commentary arguing this is a progressive step toward assistant “interoperability.” But in terms of a realpolitik perspective, the deal is mostly about distribution. Each wants access to the other’s audience. The goal is to have two integrated digital assistants who can carry out tasks across different dimensions of daily life — at home or work, and on whatever device is most convenient. Currently, Cortana and Alexa can each be enabled as a skill on the other. An Office 365 customer could, for instance, ask Cortana to summon Alexa through a PC at work and use Alexa to order groceries or adjust the thermostat before heading home for the day. And someone making breakfast in the kitchen could enlist Cortana through an Echo device to preview a daily calendar, add an item to a to-do list or check for new emails before heading to the office. On paper, each assistant brings complementary strengths to the other’s platform and, combined, they hypothetically offer more than can Siri or Google Assistant alone. And while this makes some sense strategically, the consumer benefits are less obvious as a matter of actual experience. The required, reciprocal set-up process is too complicated. Cortana is another Alexa skill. But to take full advantage of Cortana’s capabilities through Alexa, users need to “connect services” through the Cortana app. This all involves multiple screens and passwords. And in my case, it didn’t work; I wasn’t able to successfully connect my Outlook account to Cortana for access through Alexa. Most of the things that Cortana can do, Alexa already does and vice versa. Of course, Cortana offers advantages for denizens of the Microsoft software universe. Alexa’s connection to Amazon makes it more useful in that world. But the use cases and benefits are not sufficiently expansive or self-evident to motivate lots of people to use Alexa on Windows machines or Cortana on Echo devices, at least at this point. Yet corporate strategy is probably driving all this. Amazon has a large installed base of smart speaker users in the US — perhaps 32 million. Microsoft has one public smart speaker partner in Harmon Kardon. It doesn’t have its own installed base of smartphone users (Windows phone is dead) and has to rely on third-party mobile distribution for Cortana, which is not driving a lot of actual usage. And while Microsoft has roughly 400 million Windows 10 users, it’s not clear how much actual Cortana usage is going on there either (I’m willing to be corrected on this point). For its part, Amazon wants access to the 400 million Windows 10 users as part of a larger plan to put Alexa on multiple platforms — since it too doesn’t have a smartphone user base — in its battle with Google Home and the Google Assistant. It’s possible that as the two companies collect user feedback and make improvements, the partnership will bear fruit and become more seamless and useful. But based on my preliminary experience, I’m skeptical. The post Microsoft and Amazon marry their assistants, but will the honeymoon be short-lived? appeared first on Marketing Land.